“I hooked up my accelerator pedal in my car to my brake lights. I hit the gas, people behind me stop, and I’m gone.” – Stephen Write. Still, there are various fixes that you can do yourself with simple tools and little experience. Save money and time by doing basic troubleshooting and repairs on many car issues. Gain experience to fix complex issues by doing simple DIY repairs first. Keep your car in top condition by following these 25 DIY car repairs. 1. Air filter replacement. Clogged air filters lower car performances on many levels. Change your car’s air filter to increase power and gas mileage. An air filter replacement is one of the easiest DIY car repairs to do for worn out filters. 2. Oil change. Oil change is relatively easy to do yourself with certain precautions. Avoid changing oil after driving your car recently since it can be very hot. You should wait at least a couple of hours after driving your car to change the oil. Tools for a DIY oil change are ratchet, oil filter, wrench, funnel, new oil, oil container, and oil filter. 3. Spark plugs. This simple DIY procedure can make automobiles have better fuel consumption ratings and drive smoother. Spark plugs for most cars are cheap. Check the plug wires while replacing spark plugs too. 4. Windshield wipers. Replace the worn out strips of rubber found on old wipers with new ones. Change windshield wipers for optimal driving conditions during rain. Basic tools are needed like a screwdriver and new wipers to change them. 5. Headlight bulbs. Check the front of your car for burnt headlight bulbs in need of replacement. DIY headlight bulb change is possible for cars without sealed beam headlights. Be sure to get the right bulb for your car and save money by changing it yourself. 6. Dangling exhaust pipes. If you hear extra car noises from the back of your car, it could be damaged pipe holders or structure. Most cars use rubber loops to hold exhaust pipes that can be damaged over time. Look under your vehicle for any broken hangers in the exhaust pipe and change accordingly. 7. Brake pads. Always keep brake pads in optimal conditions to avoid car accidents and injury. Brake pads are a key component of the brake system that should be properly maintained. Usual tools to change brake pads are a c-clamp, lug wrench, Allen wrenches, hammer, and jack, amongst other. 8. Fuel filters. Fuel filters have an average price of $15 depending on the car, but can save hundreds of dollars from engine damage if changed regularly. Fuel filters are important to keep fuel injection and carburetor systems clean and working properly. Please, do note that it is imperative to release the fuel system pressure before replacing the fuel filter to avoid damage or injury. 9. Car radiator flush. Automobiles’ cooling systems and radiators should be cleaned to keep engines cool. Radiators can build deposits what can clog the cooling system. Perform regular radiator flushes to keep the cooling system in optimal condition. Before removing the radiator cap, to flush the radiator, check that the engine is cool. Readers, I do most of repair on our cars. We drive a BMW 528i and a Toyota Camry. I always get discounts at Advanced auto parts store. Upon request, they have given me a special discount coupon for my blog readers. Here’s the link to redeem this coupon. Save $30 off Purchases of $75 or more at AdvanceAutoParts.com with code BIG30!. Check the prices over there, even without the discount, prices are cheaper than local garage prices. And about stock they are a big warehouse so anything is available there. Just for an example, last month I changed batteries on my BMW, I paid less than $200 including shipping. I was quoted $532 at nearest BMW dealer and a local garage quoted $450 flat rate. This is the kind of saving I am talking about here. 10. ABS sensors. ABS sensors can cause the ABS light to show on cars’ dashboards if dirty. Clean ABS sensors while replacing brake pads to save on time, if possible. 11. Plug tires. Car experts differ on whether is better to patch or plug a tire. However, only use these options for short-term solutions for tire damage if not done by a professional. Tire plugs can be bought for as little as $5 to repair most tires according to the damage. 12. Fuel gauge sender. If you are running low on fuel on a constant basis, the fuel tank gauge might need replacing. Many cars have these units located under seats based on the manufacturer. Review the owner’s manual to verify the location of the fuel sender unit, and if accessible, change accordingly. 13. Brake discs. Combine changing warped brake discs with brake pad replacement to save time if needed. Warped brake discs can damage entire car axles if not corrected in time. 14. Removing stripped screws. If you have damaged a screw’s head, steps must be taken to remove it correctly. Drills are suggested to remove stripped screws with diameters to drill a hole in the screw’s head center. Once the screw’s head separates from the body, it should be easy to remove. 15. Blown fuses. If your headlights are out, it could be from a blown fuse. Check the car’s fuse box to determine which fuse needs replacing. There are three main types of car fuses, which are glass tube, blade, or ceramic. Review your car owner’s manual to find the location of fuse boxes and type of fuse required. 16. Car signal Relays. Turn signals are easy to troubleshoot, if signal relays are at fault. Bad turn signal relays can make turn signals stop blinking. Check the signal relay setup of your car for turn signal issues. 17. Car batteries. Batteries are the center of a car’s electrical mechanism. Use approved gloves and eye protection to avoid acid damage from the battery. Check the old battery with a voltmeter to see if it has the proper charge. Batteries with lower than 9.7 volts while starting an engine, should be replaced for most vehicles. 18. Seat belts and seatbelt retractors. Seat belts, by law, must be used to protect against injury in a car accident. Seat belts and belt retractors can be replaced with proper screwdrivers by simply removing the covers and placing new ones. You should test the new seat belt for optimal working conditions. 19. Window belt strips. Inspect visually window belt strips for missing parts, cracking, or other damages for replacement. Worn out window belt strips can cause water damage, if not kept in top shape. 20. Tire valve stems. Tires and wheel assemblies must be removed to change tire valve stems. Deflate tires by removing the inside valve stem. Install the new tire valve and inflate tire accordingly. 21. Serpentine belts. Check under your car’s hood or the engine compartment for the serpentine belt routing layout. The belt tensioner must be located and loosened up to remove the serpentine belt. Make sure to install the new serpentine in the same manner that the old one was routed. After installing the new belt, check the belt’s tension and adjust if necessary. 22. Tire replacement. Tire change is one of the most common DIY procedures performed by drivers. Damage wheels should be replaced with the spare tire by using the jack and tire changing tools available from most car manufacturers. A professional should balance new tires later. 23. Thermostats. Radiator thermostats provide car engines’ working temperature that should be within recommended levels. The radiator must be checked for leaks and locate the thermostat. Coolant should be drained to release pressure and to replace the thermostat housing structure faster. 24. Radiator hoses. Radiator hoses are key to maintain coolant system pressures and engines’ temperatures. Worn out radiator hoses can have leaks that drain coolant levels and heat up car engines. Check for the upper and lower radiator hoses for damage and replace as necessary. Radiator hoses are usually just held by clamps and screws depending on the type of car. 25. Washer tanks. Washer tanks are necessary to clean dirty windshields while on the road. Open your car’s hood and locate the washer tank. Remove the washer pump’s wiring to the washer tank before removing. Washer tanks are usually just held by a couple of bolts based on manufacturer. After replacement, fill the washer tank with washer fluid and test for proper function. Regular car maintenance and repairs are top priorities to keep cars away from mechanic shops. This DIY car repair list will assist you to maintain your vehicle in optimal road conditions without spending a lot of money. Get professional assistance if you find unable to fix some parts. It is important for you to follow safety procedures at all times while doing DIY car repairs. Readers, just a reminder about special discount code you are entitled for, just for being my reader, from Advanced auto parts shop. Save $30 off Purchases of $75 or more at AdvanceAutoParts.com with code BIG30! Real men enjoy DIY stuff, isn’t it? Great list. I have changed my window wipers myself a few times. I have that down pat. Some of the others though will require some practice. Youtube videos are great resources to learn tricks like these. Car batteries, this also easy you can also try this one. Before using that one you need to wear a gloves. Why do that when all the auto parts do it for free in just a few minutes. While I will agree I think it’s always best to have someone else change your oil. They have shops all around that do it for really cheap and use great oil. Plus they dispose of it properly. Basically it all depends on time vs money calculation. If you think you can better utilize the time, then go for the shops. You think? How do you know they use quality oil and filters. How do you know they always change your oil properly or at all? Do a Youtube search on this and you may rethink your comment. I can change my oil at half the price of a quick lube shop and I know it was done correctly. Well, I only do the windshield wiper and headlight repair myself. 2 down, 23 to go! I think learning to change your own oil, air filters, etc. are the most important items on this list. They not only extend the life of your vehicle significantly–regular oil changes can make a car last 300k+ miles–but also saves you $50 or $60 bucks per pop. And if you commute a long distance (like I do) you need oil changes every month or two. Very good statistical analysis. Add to tat the equipment replacements like wipers, tires, battery and you can save a lot on the lifetime of a car. I feel like I could do some of these but still would rather pay someone to change my oil. Not worth my time. All along I have been paying for oil change but, some day with nothing else to do I can venture in to DIY route. A friend recently changed my air filter. I couldn’t believe how easy it was. I had my serpentine belt changed last year and I would prefer to have a licensed mechanic change the belt. I won’t prefer fixing belts on my own either. Changing small equipment are doable. The rule of thumb should be that whenever you have doubt, refer to technicians. I had changed my own oil for years. Lately with a lot on my plate, I decided to pay for it since it would save me some time. I hated paying the $35 it cost me for some other guy to do it. I’m going to keep doing it myself, regardless of how pressed for time I am. So are you changing your mind after reading this post? Nice list! I try to avoid DIY projects or repairs with cars, as I have zero interest and I’d rather spend my time on other things. For example, I don’t change my oil, and would much rather pay somebody to do it. I enjoy doing basic work on my car. Nice list of areas to check. I’ve got an exhaust pipe rattling right now, in fact. Well, not “right now” while I’m typing this, but maybe “currently when I drive the car…” Better. I was about to respond that texting while driving is not good, then I read the second sentence. A good list. I’ve never actually paid to have someone change my oil. #7 should be Brake pads. You’re not “Break”-ing anything. Offcourse, thanks for noticing, there were several instances of breaking. Corrected now. Check your tire pressure!!!! It’s simple and the only “investment” is a few dollar air pressure gauge from auto or general store. Keep them inflated properly and learn how to see if they are wearing UNevenly and how to rotate them. None of these takes more than a few seconds and keeps you on top of the state of your engine and it’s support systems. This can alert you to problems when they are minor and fixable instead of stranding you. New belt: about $50 or less. Time to fix–less than an hour–and it’s NOT rocket science! If you can put YOUR belt on you can CHANGE this belt. Any of the above parts could cost thousands depending on your car and it’s complicated mechanisms. Designed to NOT allow YOU to fix much anymore. Also make sure your TIMING BELT–an internal part–gets CHANGED according to the recommended time or mileage–could cost you the ENTIRE ENGINE in a split second. I regularly have cars that have between 100000 and 200000 miles on them in the drive way–the only car I ever bought NEW I drove until it had 269000 miles on it and IF the timing belt had NOT snapped I would love to be driving my beloved 1984 Honda Civic right now! My current car has 181000 (2004) on it and I will be driving it twice that as long as I keep maintaining it. Thanks Halley. I was facing similar problem that Aania said. I was trying to figure out my car problem. But, failing to fix it properly. Your answer indirectly helped me to solved my issue. I have benn doing my own car repairs since I was a teenager. I learned from my uncle and it seems like over time I started venturing into the more complicated car repairs. Over time I did save a lot of money and also developed thee skills that eventually became my profession. I now own a car repair shop. It all started with the do-it-yourself spirit. Thats a great example Roberto, thanks for sharing with us. In our world, many hobby bloggers quit their job and now full time blogging from home. This is honestly one area where I need desperate improvement. Way too much time playing video games and studying when I could have been acquiring practical skills. I pay for it about twice a year when a mechanic quotes me a price and I have absolutely no idea what he’s talking about. You should change TWO of these if one goes bad–the other will go bad soon as they presumably have about the same mileage and conditions. They are easy to get to–phew!!!! That the prices for the parts themselves are INSANE if purchased from dealers or some car places BUT on Amazon they were 1/4 the going retail. So—purchased a “package” on Amazon for LESS than half the price the local places wanted for ONE of these sensors–got the two O2 sensors AND that wrench for $130. Sprayed the old ones with WD40 and let sit for awhile–and off they came and on they went. Took 20 MINUTES. The dealers? They get anywhere from $400 to $600 for ONE of these jobs. And they might NOT tell you that you should change both the “upstream” and “downstream” O2’s–so they get to grab this amount AGAIN when your Check Engine Light comes on or the cart fails inspection. Always check around on line FIRST before you buy or start wrenching away! It’s not a huge secret, but simply asking for help at the auto parts store saves LOADS of time and money. They are often happy to help, and they know what they are doing. They can also help you find the most affordable part (there is usually an economy-grade, mid-grade, and high-performance grade of any part). Wipers, headlights, fuses, air filters, batteries. All of the simple stuff they can do for you. Well these are some useful tips of DIY. In some cases we’ve to take an advice of specialist. Nice blog. All the points are very important for a car user. It is important to know all the basic procedures to solve several car issues. One can save unnecessary car expenses only by following instructions of car experts. Thanks for sharing this blog. I found some great strategies and tips analysis here, I never thought this way before. I always go to workshop to change my car oil and other breakdowns and I pay for it. If these tips will help me, surely I would avoid going to workshop for every little thing, which I can manage on my own. glad to know you’re encouraged. All the best. You’d love fixing your car. I completely agree with your article. Car repair means to recover it with any damage which may harm your car. But instead of constantly paying for repairs and its maintenance, you can just get a comfortable, nice-looking new car. Great information..Many expensive repairs can be avoided if you catch the problem early. Many car owners do simple repairs at home. If you are confident in your skills and have necessary tools,You can also do it or you can save a lot of money if you take your car to a muffler shop instead of a dealer or general car repair facility. I am so glad that I was able to find this! I always end up paying a ton for my car repairs, and I really want to start knowing how to fix my own car problems so I don’t keep paying a ton. So thanks a bunch Paul for sharing these 8 repairs I can start doing to save money. I’ll definitely remember this the next time something happens to my car. I am so glad that I was able to find this! I always end up paying a ton for my car repairs, and I really want to start knowing how to fix my own car problems so I don’t keep paying a ton. I’ll definitely remember this the next time something happens to my car. I have never altered my car. And unless I become too rich I won’t be doing that either. I follow a rule of thumb, more costly my car is, most costly it’ll be to repair! Being a mechanic, I hope no too many people read this post haha, just kidding. With the internet at your finger tips there is no reason why you cant find out how to do most minor repairs and almost all maintenance to your vehicle (You even get video walk through’s on youtube and places like ehow). You do need to be careful of doing major repair work though, making errors with major work can lead to even more expense if you need someone to fix it up. Before I visited your site in 2013, I had never thought I could do something for my car. After reading your advice, I watched on youtube and tried to change Windshield wipers firstly. Then my car had something wrong with battery so I watched many times on youtube to change battery myself, but I failed, it took me whole day but I still couldn’t do right.I called my friend Charlie who had experience in car repairing. From that time until now, I can do 20 of 25. Thanks for your helpful article. I agree what you said about “the more costly the car, the more expensive the repair!” I took some time to read through your list of the top 25 and have to admit there are a few of them that I should brush up on and get more familiar with. I think a lot of car owners get miffed just by popping the hood and staring blankly trying to find an obvious problem (which 90% of the time is never obvious). An article like this is good to cover more than just the basics of what needs consistent maintenance or at least check ups. That coupled with catching up on Youtube example videos can get a guy in the right place to be able to handle these 25 by himself. Car repair is fulfilling when you can do it yourself. Thanks for the quality insight and detailed post! Saved $1000 bucks last year doing the following – spark plug change, coolant change, transmission oil change, pcv valve change, egr cleaning, power steering flush, brake fluid bleeding, MAF cleaning – it looks a lot of work but actually it was easy with advance research, proper tools and some guts. Thank God for Youtube and Google and all the DIY folks out there. This year I am doing my brake system and intake manifold cleaning. Thanks. Wow i just realized its been a year when i sent my comments. Learned a few more DIYs for my car – i now change my oil, did intake cleaning (manifold and throttle body, the last major work was to replace both lower control arms, both bushings and stabilizer links. Saved a lot of money on labor costs alone. Just an update on this. Did my front shocks last saturday. I cant believe how easy it was to do the job. Having the right tools (from Home Depot) and advance research from Youtube and Ody Club forums saved me hundreds of $$$. I used the money I saved in labor costs in buying the original parts than I needed. Next project would be the engine/transmission mounts. Great list. I am so happy that you share this tips. I just bought the things I need for my car. Now I can save more money instead of bringing my car to a repair shop for an engine oil, now I can do it in my home. I want to learn how to repair. Thanks brother! I’m not normally a car guy, but I would really like to become familiar enough that I can do some repairs on my own without having to go into the shop. One issue I am having in my car is my battery. It actually is less than 9.7 volts, I didn’t realize I would need to replace it. I will make sure and keep learning. Do it yourself is considered as an important practice to cut your expenses. With your little knowledge you can also repair few parts on your car. But before that, you have to keep few tools with you. Think, in case, you are asked to buy a long list of expensive tools for the maintenance, definitely, you won’t be interested on that. When you have to keep ready only a few set of items, you can do it with more interest. The post here claims one can repair twenty-five parts of a car with his own hands without taking it to a garage. I’m so glad that you percentage this recommendation. I simply bought the materials I want for my car. Now I’m able to save extra money instead of bringing my car to a repair keep for an engine oil, now I will do it in my home. I want to learn how to repair. Genuinely for me, car repair and maintenance are 2 vital aspects. In fact, neither repair nor aftercare should be overlooked. It is the best possible way to maintain smooth running and also to expand the lifespan of a vehicle. Ya, sometimes these repair bills can tremble our budget to a greater extent. That does not mean, we will bounce all the car maintenance and repair procedures. No, we should not be. My standpoint is if anyone wants to save money on car repairs, then instead of skipping, he should try some repairs(listed above) on his own, by which he can save the labor cost that a professional usually take while fixing the issues. Still, if you think you are incapable to fix specific issues, then, in that case, it will be better to take the help of a specialist than that of leaving undone completely. Thanks for your article . I just write for my blog about the auto parts . I learned about from here . 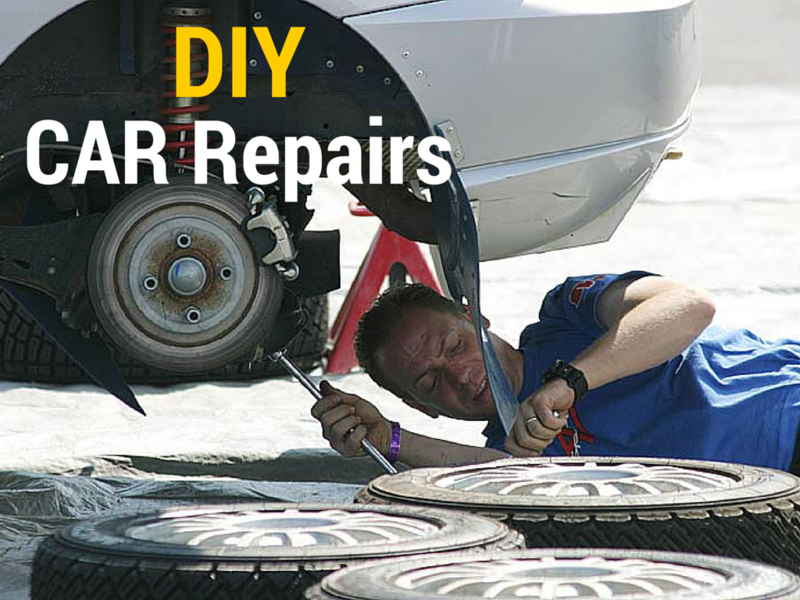 The post comprises very interesting and useful tips in order to repair your own car. We could try to fix our cars by ourselves by using your tips, which could lower the price of repairing from a repairing center. But the thing is that, repairing should be done by certified mechanics in order to prevent any type of measure damage that could be caused by us, as we are not mechanics. However, we can do some repairing, like tire changing but can’t repair deep damages and shouldn’t try to repair deep damage as it might increase our cost in repairing center. Thank you for sharing your post with us. You have some wimps in this thread. Most repairs can be done by yourself and when you do them, you will say to yourself, ” I can’t believe how easy that was” Trust me. I’m not a mechanic but I’ve replaced brakes, struts, water pumps, tie rod ends, inner tie rods, power steering pumps, fans, radiators, oil changes, tune ups and power window motors.. It is not complicated depending on your car. Some cars I wouldn’t touch. Mechanics charge a lot of money even for the most basic of repairs you can do yourself and they play on your ignorance. Most of us, car owners, just daunt that feeling we get whenever we need to have something repaired in our vehicles. That annoying and helpless understanding that we simply cannot do anything to avoid that expense, if we still need and want to use our cars. Why? Because nothing blows our budget or financial state than an unexpected car repair. All car owner wants to get their car in well conditioned after servicing by paying less amount of money. Having basic knowledge for preserving your vehicle by keeping all the parts in good working order you have to make some replacement of worn parts of the vehicle. Changing of oil filter, air filter and also engine oil in every 5,000 miles protect your vehicle’s engine from risk of getting clogged and fit it to a position to shows its best performance on the road. Automobiles’ cooling systems and radiators should be cleaned to keep engines cool. Always keep brake pads in optimal conditions to avoid car accidents and injury. To get better fuel consumption rating and drive smoothly it is required to have spark plug in good condition. 14. Removing stripped screws. — Walmart sells an as-seen-on-TV a set of screw extracting bits for about $5. I forget the name of it but I bought a set, years ago, and they work great. I really, really appreciate this 25 DIY car repair tips. I am only aware of the basic troubleshooting steps and am having a hard time repairing it myself. I can do the tire replacement, yes, but when it comes to checking the radiator, I just don’t know what to do. Most of the repair tips, I have just read them here, so I may say that you are such a genius writer as you know what is exactly needed by your readers! HUGE THUMBS UP! Amazing ,I din’t know much about about how to go for it .I usually used to give my car to the mechanic which costs me a lot every time. But your tips and ideas are great and helpful .Thanks a lot for saving my so much money. You meant you only went to one mechanic for your all your repair needs? Didn’t you try to get a quote elsewhere? I started diy with my car 3 months back. Just got to get over the initial feeling that u cant fix cars and you are just not qualified enough. Started with a tune up…..never looked back. For me fixing my own car it’s not just satisfying it’s also a confidence booster. Now I am just a bit more confident in life, knowing that I can handle whatever life throws at me. I usually used to give my car to the mechanic which costs me a lot every time. I didn’t thought about it as i can do it by myself. But your tips and ideas are great and helpful. I hope these tips are going to save my money. If you had more insight i will greatly appreciate it. Thanks for the sharing such kind of helpful article. Hello Admin, it’s very exciting to see the entire list you have mentioned in your article. Now I really want to try change my wipers as they are needed to be replaced. Thanks for sharing such a great article! No matter which model you own, because each model requires some kind of maintenance and repair at its older age. Thus, repair is an inevitable part of owning a speed machine. Keeping the convertible in a gilt-edged shape is the responsibility of car parent. However, keeping the maintenance cost within the spreadsheet is one of the chores that a motorist should always remain accountable for. No doubt, systematic car care saves money. But if you develop the minimum mechanical prowess, then you can be able to perform the simple aftercare assignments including- oil change, brake pad replacement, battery replacement etc, on your own which will reduce your overall auto maintenance expenses and allow you to save a big. If you have time and want to save money, then you can keep your car in top condition just by keeping some points in mind and by regularly check. Oil should be change on every 1000 km and it is easy to change by yourself. If you are going for long tours just check your brake pads as they avoid accidents and main element of brake system. I like your advice about the importance of following safety procedures while doing DIY car repairs. Repairing a car at home can be harmful as it involves plenty of tools and equipment. One thing we can consider is to use proper safety gear whenever we repair our car this includes wearing safety glasses, dust masks, and gloves. Car Repair at home can save us tons of money, but it can also be dangerous if not done with a proper care and safety measures. By the way, Great job on the post.